MATERIALS such as titanium alloys and bonded carbon fiber were once only available to space programs. What was once unobtainium has trickled into products we now use everyday. The firearm industry now offers these advanced materials commercially through parts such as pins and bolt carrier groups. As many of you know, even barrels can be constructed using carbon fiber technology, resulting in as much as 25-percent weight savings when compared to their steel cousins. It is said that these carbon fiber barrels even increase rigidity and accuracy. Shortly after being hired as a police officer, one of my Field Training Officers (FTO) advised me to make firearms training and mindset a priority throughout my career. This particular FTO was very experienced and, at the time, had already prevailed in two officer-involved shootings. He knew what good training was and what it took to win. He recommended taking a course at either Jeff Cooper’s Gunsite or Clint Smith’s Thunder Ranch. Over the course of my field training, we talked at length about officer survival and those two facilities. Unfortunately, I never made it to either during my law enforcement career. Last fall, the opportunity to attend an Urban Precision Rifle (UPR) course at Thunder Ranch became available. I seized the opportunity to train with Smith, a veteran U.S. Marine and police officer who served two tours in Vietnam and was on his department’s SWAT team. His teachings are based on this type of experience. As he often says, “The only goal is to win.” The UPR course is a blend of two Thunder Ranch staples: Urban Rifle and Precision Rifle. The course is taught by the man himself, Clint Smith. It is designed to prepare students to fight and prevail in an urban environment using a rifle equipped with a low-power variable scope. More on that in a bit. Thunder Ranch is now located in the hills of Lakeview, Oregon. Until Clint and Heidi Smith moved to Oregon in 2004, Thunder Ranch was found in Texas. This new home is manicured and welcoming. It’s a big change from their former dusty ranges. You can lose yourself in the impressiveness of this training site until the man speaks. Smith’s raspy voice projects through your ears, giving students momentary flashbacks to boot camp. His voice is a reminder that this Marine is still on his game. As he did in uniform, Smith still carries a full-size 1911. Although he sounds rough, he takes a personal interest in his students’ success. He said he’s getting older, and as such, doesn’t want to tote around a carbine that weighs 8-plus pounds when he can carry one that weighs a little over 5. I don’t either. Lightweight rifles are currently in vogue. With few exceptions, when we go ultra light, durability and accuracy usually suffer unless we pull out all the stops, throw price point to the wind and use the absolute best components money can buy. 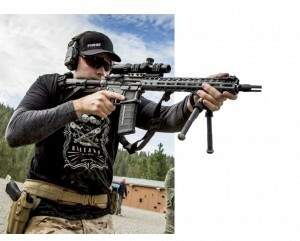 Smith began collaborating with longtime friends Sterling Brecklin and Sheri Johnson of EraThr3 (pronounced “era-three”) to build a carbine to his specifications. Both Brecklin and Johnson worked together at the famed Noveske Rifleworks. 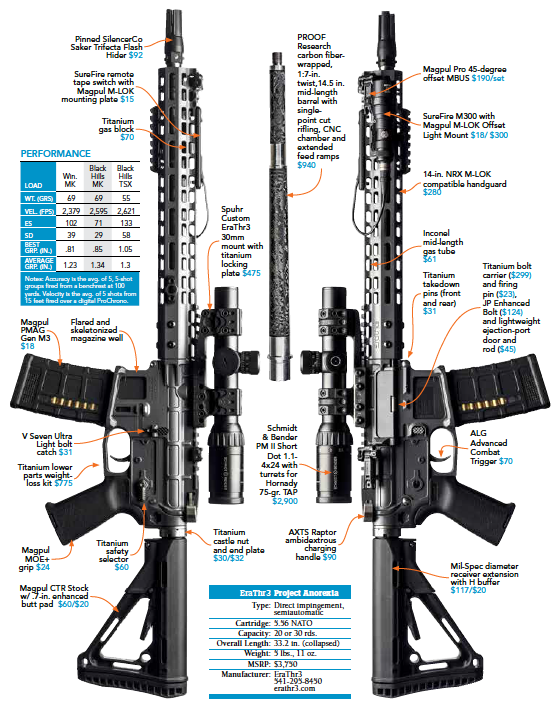 EraThr3 has taken rifle building to the next level by offering the superguns of the rifle industry. Each rifle is hand assembled using the aforementioned materials. Component cost isn’t considered in their creations. Each rifle is developed for a specific purpose, capable of extreme accuracy, while remaining lightweight and durable. At the time of this writing, EraThr3 offers six carbines, three bolt guns and one 1911 pistol. The carbine evaluated here is one of the six carbine variants. It is known as the Thunder Ranch “Skinny Gun.” If you are searching for it on the EraThr3 website (erathr3.com), it’s listed as “Project Anorexia.” If you’re in the market for a no-expense-spared scalpel with the durability of a hammer, this is your brand. If you have a lighter gun, you can carry more ammo, more water and/or more task-specific gear. If you’re only carrying your rifle 25 yards from your car to the shooting bench, you may not care about weight. If using the rifle for duty, in the field or for a shooting course, a lighter-weight rifle will pay dividends when it comes time to actually use it. “There was an honest and sincere effort to make this gun as functional as possible. We wanted a short, lightweight, yet precision-accurate fighting rifle that will do it all, and we feel that goal was achieved with the Skinny Gun,” Smith said. It’s hard to determine which of the components will jump out first, but let’s start with the skeletonized magazine well. All small parts, to include trigger pins and takedown pins, safety selector, castle nut, barrel nut and even the bolt carrier, are constructed of titanium, which reduces parts weight by half. The 14-inch EraThr3 rail is very thin in profile and has been lightened everywhere possible. Brecklin said, “It still maintains strength and rigidity.” EraThr3 chose to cut slots in the rail that are compatible with Magpul’s M-LOK system, which makes direct attaching accessories sleeker and further reduces weight by ditching heavier Picatinny rail sections. The heart of this carbine is the carbon fiber barrel made by PROOF Research. At 14 1/2 inches, it is the shortest (and lightest) we can go without the hassle of submitting paperwork to the BATF. To make it legal, the SilencerCo three-prong Trifecta flash hider (and suppressor adaptor) was pinned and welded in place for an overall length of 16 inches. The barrel is 24-percent lighter than a standard government profile 14.-inch M4 barrel. With Black Hills ammunition, this carbon-wrapped PROOF barrel is advertised for sub-1/2-inch groups at 100 yards. The Trigger Smith reminded us that “there are at least two dozen AR triggers on the market: flat triggers, match triggers and little 2-pound triggers. ACT stands for Advanced Combat Trigger, and it is similar to a standard trigger, however, the break is more defined and the grittiness of the pull has been removed. Each part has been coated in electroless nickel, resulting in a smooth pull. Smith would rather we spend $300 on ammo and shoot it through our gun than spend $300 on a trigger job. The Urban Precision Rifle Using Black Hills 77-grain Open Tip Match (OTM) ammo, all students easily owned everything from contact distance to 300 yards. Consistent hits on IPSC B/C steel out to 400 yards were attainable by most students using Smith’s signature rifle. 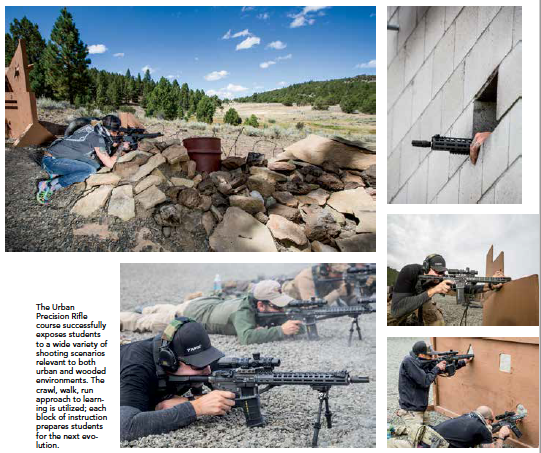 Beyond 400 yards, the 5.56 bullet begins to drop off and the wind will push it around — no matter how good the gun is. “With this combination, we own 300 yards and have the glass for it,” Smith concluded. Schmidt & Bender Short Dot My rifle was equipped with a 1.1-4X Schmidt & Bender Short Dot with a mil-dot based reticle and a daylight illuminated center dot in the first focal plane (FFP). The optic was mounted in a custom EraThr3 Spuhr mount, which featured a titanium locking plate. While moving through the Terminator 3 — a customizable two story shoothouse — we took advantage of the scope’s 1.1X setting and illuminated dot for room clearing in reduced light. One at a time, we cleared our way to the second floor and approached a hallway located on one wall. We observed a series of windows and slots cut into the face varying from several inches off the floor to 4 feet in height. We got into a firing position at each of the stations and shot one round at an assigned steel silhouette target at 100 yards. Having the ability to power up to 4X was beneficial in helping us rapidly acquire and engage targets before moving to the next station. We would then transition back to 1.1X, clear our way down a stairwell to another hallway featuring similar stations, and dial back to 4X prior to engaging. We quickly confirmed the benefits of a low-power variable, illuminated scope with extraordinarily clear glass. Magpul Offset Backup Sights Even though you have to cant the gun to use them, Magpul’s new-for-2015 MBUS work well. Because our Schmidt & Bender Short Dots were mounted to our rifles with a Torx screw mount, offset metallic sights were a must-have in the unlikelihood that our primary optic failed or was severely damaged. Students engaged IPSC steel at 75 and 100 yards with both the primary optic and offset irons at Thunderville, an area of Thunder Ranch that mimics obstacles found in an urban environment. Thunderville provides students with approximately 10 different stations on a line the length of the range. Each station prepares shooters to engage targets from different heights and different-size windows, walls, holes in walls, barricades, vehicles, pick-up truck beds, culverts (some of which you crawl into), stair steps and more. After the first shooter made the appropriate number of hits on target — usually one or two— they would move to the next station. Then the next student in line would quickly approach the first station. This added a stressor to the course of fire, in addition to numerous instructors verbally motivating students while safely moving them along and giving them helpful hints. The takeaway for participants is that it pays to practice with iron sights. The EraThr3 rifle made initial flat-range drills, such as shooting on the move, “up” drills and reloads, easier on the arms, shoulders, back and neck. This shortened recovery time and gave us more stamina as the course of instruction became more physical. Each day, additional skills were added to our toolbox to help us solve more complex problems. We spent a lot of time using barricades as cover and concealment. We worked from the prone, kneeling and crouching positions and back again. All the while, students were pressed to take advantage of their environment. It was a very inclusive course. We learned how to safely leapfrog with other shooters and how to move up and down staggered barricades, sometimes alone and other times in pairs. 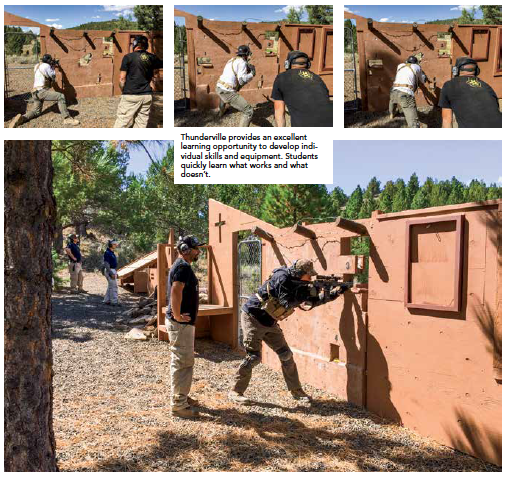 Some exercises culminated with team-on-team competitions, while others had us paired with an instructor walking down a trail and engaging steel targets that appeared at unknown distances and from behind obstructions or corners in a wooded environment. We honed our ability to shoot at targets in motion while moving ourselves, as well as from stationary positions and from behind barricades. The class was physically intense. The lightweight characteristic of the EraThr3 rifle certainly offset the heavy weight of the 20-ounce scope and 7.4-ounce mount. Smith’s personal rifle is set up the way I would want mine. His carried an Aimpoint Micro T-1 red dot and a SureFire X300 white light for identifying targets. It’s a racegun. Everything you need, nothing you don’t and fast as all get-out. Parting Shot I wish I had trained at Thunder Ranch sooner. 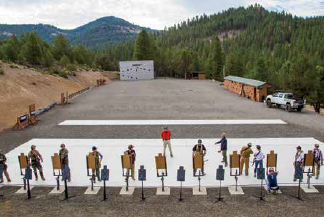 The course description is very accurate; Smith’s training teaches us how to be urban riflemen and even gives the more experienced shooter a place to practice. I could not replicate the shoothouse environment that they have at Thunder Ranch or the expansive Thunderville positional shooting range. I could spend an entire 24 hours on the Thunderville range and be eager to do it again the next day. Smith prepared us for realistic positional shooting in a neighborhood — or any other outdoor environment. Thunder Ranch is a place to learn and to improve our capabilities. A lower-cost mobile training team can’t replicate this experience. If you can afford to go all in, such training and hardware is a great investment in yourself.